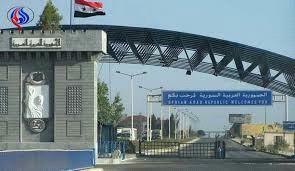 AMMONNEWS - Jordanians are sounding caution about venturing into Syria through the recently reopened Nassib border crossing after one person was detained for almost two weeks and two others went missing. Authorities on Tuesday released Jordanian citizen Yacoub Youssef Suleiman Al Aqrabawi, who was arrested at the crossing on November 1, the Jordanian Foreign Ministry told The National. Mr Al Aqrabawi's detention, as well as the disappearance of two other Jordanians who crossed into Syria at Nassib, had prompted Jordanian citizens and officials such as parliamentarian Saleh Armouti to caution against travel to Syria. However, a source from the media department at the foreign ministry said Mr Al Aqrabawi had been arrested due to a “private issue” linked to an “Interpol warrant issued by the UAE,” and not because of political or security problems with the Syrian government. The Jordanian embassies in Damascus and in Abu Dhabi worked on securing his release, said the source, who was not allowed to disclose details of the complaint lodged by the UAE.